All praise is due to Allah, the Patron of the pious and the righteous. May the most complete and enduring prayers and blessings be upon the Messenger of guidance and the Imam of the pious who is sent as a mercy to the worlds, and upon his family, his companions, and his beneficent followers until the Day of Judgement. Ameen! 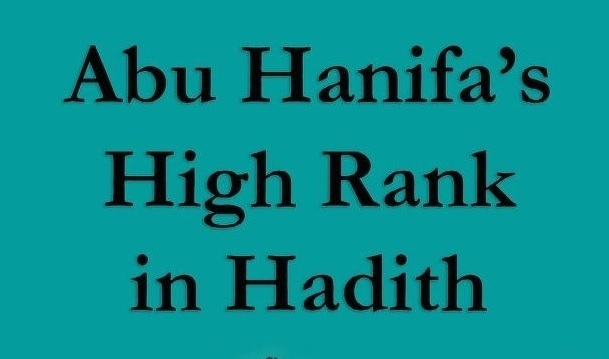 This is a beneficial, precious, glorious unique book titled “Abu Hanifa’s High Rank in Hadith” written by the late Muhammed Abdur Rashid al-Nu’mani (may Allah protect him ) who was a great investigative scholar, critic, and Hadith Master. He held the post of Grand Shaykh of Hadith and its sciences at the University of Al- Ulum Al-Islamiyyah in Karachi, Pakistan. This school was founded by our teacher, magnificent scholar, Hadith Master, jurist of applied and theoretical law, Al-Mahasin Al-Sayyid Muhammed Yusuf Al-Hussaini al-Banuri – may Allah have mercy on him. This edition [of the book] is distinguished from former editions in that it was read to the author (may Allah have mercy on him) and he took the time to make some minor changes. He also added a significant amount of important new material. The author, may Allah have mercy on him, spared no effort in collecting many jewels for this book. Besides the followers of Abu Hanifa, quite a few jurists, Hadith Masters and historians wrote books to eliminate the confusion that some fanatics have stirred up regarding the stature of Imam Abu Hanifa (may Allah be pleased with him). Among these great scholars, are the great Imam, jurist and Hadith Master of North-West Africa, Abu Umar ibn Abd al Barr (follower of Maliki school), the great Imam, Hadith master and critic Shams Al-Din Al-Dhahabi (follower of Shafi’i school), the great Imam, jurist and Hadith Master Yusuf bin Hasan bin Abd Al-Hadi Al-Dimashqi Al-Salihi (follower of Hanbali school) who is more commonly known as ibn Al-Mibrad who died in the year 909 . [In addition to those just mentioned,] the great Imam and the Hadith Master and critic Al-Suyuti (follower of Shafi’i school), the great Imam Hadith Master and critic Muhammed bin Yusuf Al-Salihi (follower of Shafi’i school), the great Shafii Jurist Imam Ibn Hajar Al-Haytami Al-Makki also wrote on this subject. They authored long books narrating the virtues and excellence of Imam Abu Hanifa, stating his greatness and stature as an [Independent] Jurist. They defended the Imam against disgraceful and envious insulters. Since the disease of the belittlement of the rank of Imam Abu Hanifa in Hadith has become epidemic in some Arab countries  where [earnest] readers are seeking access to refutational publications like this in order to counter accusations of the [smear] campaign against the Imam, we introduced this book to inform people about what the [true] masters of Hadith Science and Jurisprudence have to say about him. This work strives to serve as a lighthouse for those who seek guidance and as a reminder for those who are dreadful partisans. Verily Allah is the guide to the straight path and may the prayers and peace be upon our Prophet, Messenger and Master Muhammed and upon his family and companions, all of them. All praise is due to Allah the Lord of the worlds. 2 The dates in this book are based on the Islamic Hijri calendar unless otherwise noted.